Carhartt® is the industry leading outdoor and work apparel brand. Let you Wrangler JL’s interior keep up with the rest of your rugged lifestyle with a Covercraft Carhartt Rear SeatSaver Seat Protector. Covercraft is known for their vehicle specific custom fit seat covers. This precision and attention to detail is complimented by Carhartt’s heavy duty signature duck material. With their triple stitched main seams, Carhartt rivets, and a Durable Water-Repellent (DWR) finish these tough as nails seat covers can hold up to any abuse. They are perfect for dog owners, hunters, contractors, or anyone looking to add protection and style to their Jeep’s interior. Covercraft backs these covers with a 2 year limited warranty. Convenient Design: Covercraft seat covers can be installed and removed in minutes. For ease of cleaning, the Carhartt Rear SeatSaver Seat Protectors are fully machine washable. Mud, dirt, dust, and dog hair can all be easily washed away. Precision Fit: Covercraft seat covers are custom made and vehicle specific. They are not baggy or one size fits all. 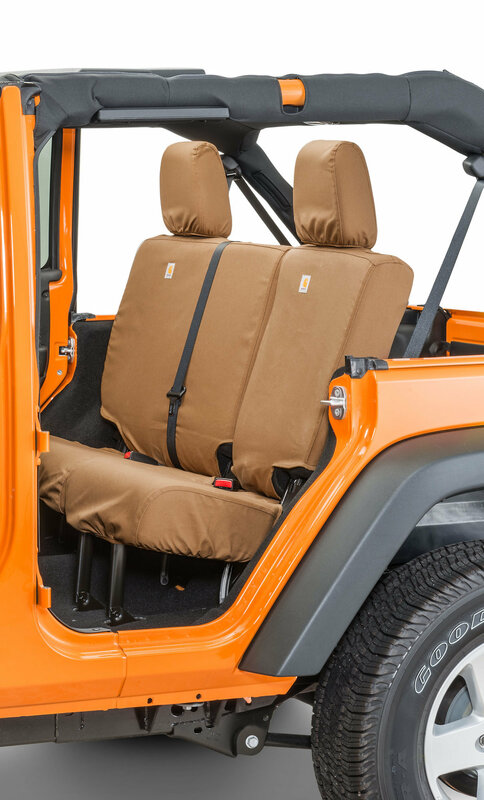 These Carhartt seat covers are designed to fit the Wrangler JL 2 door. Two Color Options: These seat covers are available in either Carhartt’s signature Brown or Gravel Gray. The SeatSavers can complement any Wrangler JL’s interior. These covers feature rivets and Carhartt logos, just like Carhartt’s line of work wear.